Graceful annual for the border, producing delicate flowers and foliage, splendid for cut flowers. 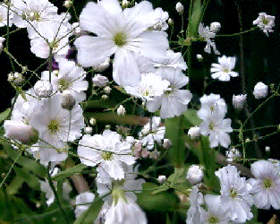 Can also be grown as flowering pot plants, grown in drifts or planted so as to cascade down steep banks or dry walls. Sow early spring outdoors 3mm deep in rows 30cm apart. Germination usually takes approximately 21 days. An autumn sowing can be made for overwintering to produce earlier flowers and they can also be autumn sown and grown on in pots in a well ventilated cold greenhouse to produce spring flowering pot plants.